Is America Ready for a White, Male Secretary of State? In January, Hillary Clinton will be stepping down as President Obama's Secretary of State, and rumors are already swirling over who will replace her. Among the maybe-candidates are Massachusetts Senator ex-Presidential nominee John Kerry and former Utah Governor, ambassador to China, and too-reasonable-to-survive-the-primary Republican Presidential candidate Jon Huntsman. While Huntsman and Kerry have both demonstrated that they have foreign policy chops, the US hasn't had a white male Secretary of State since 1997. Is America ready? The Secretary of State job requires both tenacity and restraint, both of which may be difficult for a man's unique chemical constitution. The male hormone testosterone, while responsible for such wondrous miracles as back hair and upper body strength, is also responsible for an increase in male aggression, anger, and even violence. Diplomacy is a difficult enough task without having to temper a man's natural tendency to throw chairs through windows when angered by gridlock. Further, it's a well-known fact that men's lack of intuition and emotional intelligence has translated into a troubling inability to cry under appropriate circumstances. War, death, and destruction are horrifying realities that Secretaries of State from Madeleine Albright to Condoleezza Rice have had to face, and an insufficient emotional response to tragedy will reflect poorly on our country. Do we want our allies to think we're a bunch of callous jerks who are totally unmoved by the death of innocents? Yes, Huntsman has been a career diplomat who has managed to avoid punching foreign leaders in the face out of anger during his work for four different Presidential administrations or inappropriately smiling during serious discussions because he's excited that the Utah Utes football team won. 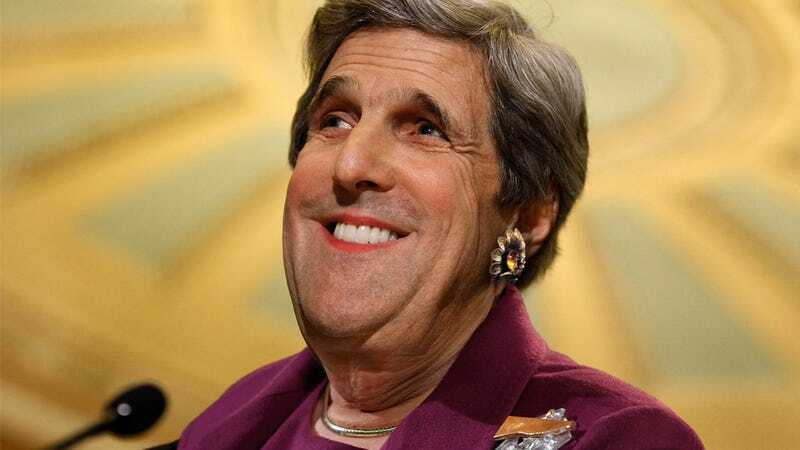 And sure, John Kerry's tenure as the chair of the Senate Foreign Relations Committee has been remarkably free of in-chamber shootings, but any testosterone-producing, low emotion man is a ticking time bomb. If either Jo(h)n ends up accepting an appointment as Secretar of State, let's hope the Obama administration is smart enough to recommend he always travel with a trusted female chaperone who can help him navigate the volatile male hormonal landscape. In addition to fluctuating male hormones, a male Secretary of State will undoubtedly be faced with the difficult task of trying to balance work and family. For generations, men have tried to "have it all" — the great career, the perfect family, a hot body, a youthful, buoyant buttocks — but many have hit a "glass propeller" during their quest. I know it's not the "politically correct" question to ask, but it needs to be addressed when making important decisions about men in the workplace: if Jon Huntsman is appointed head of the State Department, can we trust him not to shirk his responsibilities in favor of fulfilling his duties as a father of seven? His youngest daughter, whom Huntsman and his wife adopted from India, is only 6 years old. Who is going to drive her to soccer practice? Who is going to make after school snacks? Can America, with a clean conscience, remove a father from his natural role as hands-on provider and permission slip signer? And Kerry's first grandchild was born earlier this year. Can we trust a doting grandpa to grant the State Department the seriousness it warrants? The Jo(h)ns' race and gender may also interfere with their ability to relate to many foreign leaders unaccustomed to socializing with men. How are we to advance our relations with South America, for example, when Brazilian President Dilma Rousseff and Argentinian President Cristina Fernández de Kirchner want to go get pedicures at a women-only spa? What happens when Australia's Julia Gillard wants to go shoe shopping and they don't have any cute espadrilles in Huntsman's size? How can we hope to maintain healthy relationships with our European allies when John Kerry can't sit in a sauna with Angela Merkel, Danish Prime Minister Helle Thorning-Schmidt, Lithuanian President Dalia Grybauskaitė, and Jóhanna Sigurðardóttir, the Prime Minister of Iceland? That's how all of the diplomacy is done over there! In saunas! Being a man means there are female-only spheres that Huntsman and Kerry simply won't be able to penetrate, to the detriment of America. And the Jo(h)ns' whiteness won't serve them well, either. Depending on which suspect online source you consult, something between 10 and 15% of the world's population is white. And of those white people, only half of them are men. That's some pretty low relatability. Besides the obvious issues of male physiology, men's natural tendency to be more violent and confrontational, the concern that Huntsman or Kerry will abuse paternity and grandpaternity leave because of family obligations, and a man's inability to socialize with certain female world leaders, other issues should raise serious questions about a man's ability to adequately perform the duties of Secretary of State. Men's reduced life expectancy means that the President may have to retrain a new Secretary of State if either man becomes suddenly afflicted with a number of male-specific diseases. And the fact that men don't tend to carry purses means that if a foreign leader needs somewhere to put their cell phone, neither man will be able to offer aid. As Secretary of State, Hillary Clinton logged almost a million miles traveling and didn't headbutt anyone or get prostate cancer. Can we trust a man to do the same? Perhaps Obama should consider the country's readiness for a white, male Secretary of State before doing anything rash. Besides, what's wrong with Susan Rice?